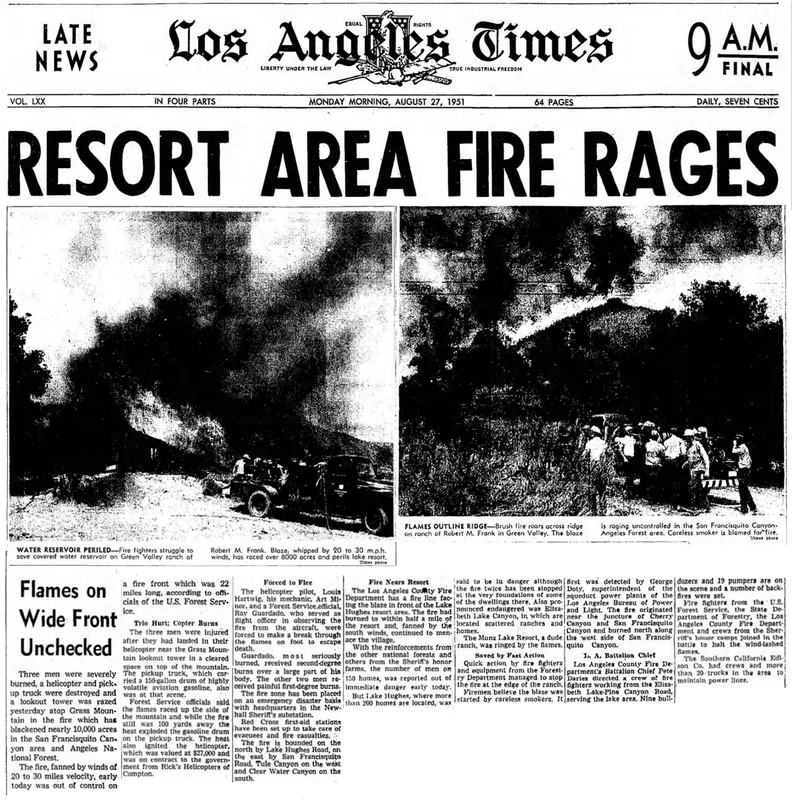 SCVHistory.com | Lake Hughes | Helicopter Burns, Crew Badly Injured in 9,300-Acre Brush Fire, August 1951. Fire Blackens 9,300 Acres of San Francisquito, Lake Communities. 3-Man Crew Badly Injured When Helicopter Catches Fire. Incident Late August 1951 | News Reports. Flames on Wide Front Unchecked. Los Angeles Times | Monday, August 27, 1951. Three men were severely burned, a helicopter and pickup truck were destroyed and a lookout tower was razed yesterday atop Grass Mountain in the fire which has blackened nearly 10,000 acres in the San Francisquito Canyon area and Angeles National Forest. The fire, fanned by winds of 20 to 30 miles velocity, early today was out of control on a fire front which was 22 miles long, according to officials of the U.S. Forest Service. The three men were injured after they had landed in their helicopter near the Grass Mountain lookout tower in a cleared space on top of the mountain. The pickup truck, which carried a 150-gallon drum of highly volatile aviation gasoline, also was at that scene. Forest Service officials said the flames raced up the side of the mountain and while the fire still was 100 yards away the heat exploded the gasoline drum on the pickup truck. The heat also ignited the helicopter, which was valued at $27,000 and was on contract to the government from Rick's Helicopters of Compton. The helicopter pilot, Louis Hartwig, his mechanic. Art Minor, and a Forest Service official, Ray Guardado, who served as flight officer in observing the fire from the aircraft, were forced to make a break through the flames on foot to escape death. Guardado, most seriously burned, received second-degree burns over a large part of his body. The other two men received painful first-degree burns. The fire zone has been placed on an emergency disaster basis with headquarters in the Newhall Sheriff's substation. Red Cross first-aid stations have been set up to take care of evacuees and fire casualties. The fire is bounded on the north by Lake Hughes Road, on the east by San Francisquito Road, Tule Canyon on the west and Clear Water Canyon on the south. The Los Angeles County Fire Department has a fire line facing the blaze in front of the Lake Hughes resort area. The fire had burned to within half a mile or the resort and, fanned by the south winds, continued to menace the village. With the reinforcements from the other national forests and others from the Sheriff's honor farms, the number of men on 150 homes, was reported out of immediate danger early today [sic; bad jump in original layout]. But Lake Hughes, where more than 200 homes are located, was said to be in danger although the fire twice has been slopped at the very foundations of some of the dwellings there. Also pronounced endangered was Elizabeth Lake Canyon, in which are located scattered ranches and homes. The Munz Lake Resort, a dude ranch, was ringed by the flames. Quick action by fire fighters and equipment from the Forestry Department managed to stop the fire at the edge of the ranch. Firemen believe the blaze was started by careless smokers. It first was detected by George Doty, superintendent of the aqueduct power plants of the Los Angeles Bureau of Power and Light. The fire originated near the juncture of Cherry Canyon and San Francisquito Canyon and burned north along the west side of San Francisquito Canyon. Los Angelea County Fire Department's Battalion Chief Pete Daries directed a crew of fire fighters working from the Elizabeth Lake-Pine Canyon Road, serving the lake area. Nine bulldozers and 19 pumpers are on the scene and a number of backfires were set. Fire fighters front the U.S. Forest Service, the State Department of Forestry, the Los Angeles County Fire Department and crews from the Sheriff's honor camps joined in the battle to halt the wind-lashed flames. The Southern California Edison Co. had crews and more than 20 trucks in the area to maintain power lines. Rainfall Douses Remaining Fire at Lake Hughes. Los Angeles Times | Thursday, August 30, 1951. Not only the remains of the 9,300-acre Lake Hughes brush fire were extinguished by yesterday's rainfall, but the efforts of firemen to purposely burn of a larger area were also foiled. The U.S. Forest Service said yesterday that final figures showed the total burn area as 9,300 acres. The interrupted burn-off involves a sector of more than 800 acres of Elizabeth Lake Canyon, about one and a half miles south of Lake Hughes resort. In all, there were 24 miles of fire line for workers to patrol at the height of the fire, which was termed the largest blaze of the season for Angeles National Forest. Crews of fire-fighting specialists will remain on duty in the area for the rest of the week, guarding against possible new spot fires being fanned into active fire fronts.